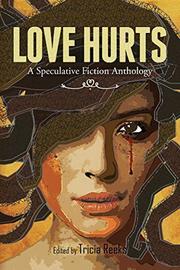 In this anthology of short speculative fiction, debut editor Reeks gathers 26 stories about love—and the jealousy, sacrifice, and pain that can haunt even the most devoted hearts. “I’ve always had a taste for dark,” says Reeks in her introduction, and she goes on to prove it with a top-shelf selection of tales, 20 of which are original to this book. They run the gamut of sci-fi and fantasy subgenres: there’s the gory horror of Matt Leivers’ “The Ghûl” and David Stevens’ “The Boulevardier”; the quickly sketched dystopias of Steve Simpson’s “Jacinta’s Lovers” and Michal Wojcik’s “Iron Roses”; and the time-travel troubles of Michael Milne’s “Traveler” and G. Scott Huggins’ “Past Perfect.” Although most of the stories focus on heterosexual romance, Reeks also features LGBT authors, such as io9 editor Charlie Jane Anders, whose snarky urban-fantasy tale, “Fairy Werewolf vs. Vampire Zombie,” is as laugh-out-loud funny as the title implies, and A. Merc Rustad, whose beautiful story, “The Sorcerer’s Unattainable Gardens,” gets the anthology off to a strong start. She also includes tales about different types of love, such as Jeff Vandermeer’s “A Heart for Lucretia,” about a brother who’s willing to give up anything for his sister, even himself, and Mel Paisley’s short but heartbreaking “A Concise Protocol for Efficient Deicide,” in which a captive alien soothes a mutilated human child with dreams of escaping the scientists who hold them both, so they can go someplace “Where they could understand something without breaking it.” Other standouts include “Virgin of the Sands” by Holly Phillips, set in a World War II–era North Africa, where an army-intelligence group employs a necromancer; “Back to Where I Know You,” by Victoria Zelvin, in which two women struggle to prevent their memories of each other from being erased; and “While (U>I)I- -;” by Hugh Howey, a tear-jerker about an android who meticulously ages himself for the sake of his robot-hating wife. A well-organized, wide-ranging collection of consistently strong genre stories.